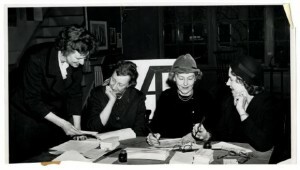 Members of the Print Club , as the Print Center was formerly known, in an undated photograph from its archives. Courtesy of Historical Society of Pennsylvania. As the keeper of The Print Center’s historical records, Historical Society of Pennsylvania will help tell the story of the organization through a new document display. The prints of pioneering female artist Violet Oakley will also be featured. On view December 1, 2015 – January 8, 2016. Presented as part of The Print Center 100. One of the oldest historical societies in the United States, the Historical society of Pennsylvania is home to some 600,000 printed items and more than 21 million manuscript and graphic items. Its unparalleled collections encompass more than 350 years of America’s history—from its 17th Century origins to the contributions of its most recent immigrants.